Last year we had an exceptionally dry spring; there was no water supply at Sims Hill. We were amazed at the soils’ capacity to hold moisture. 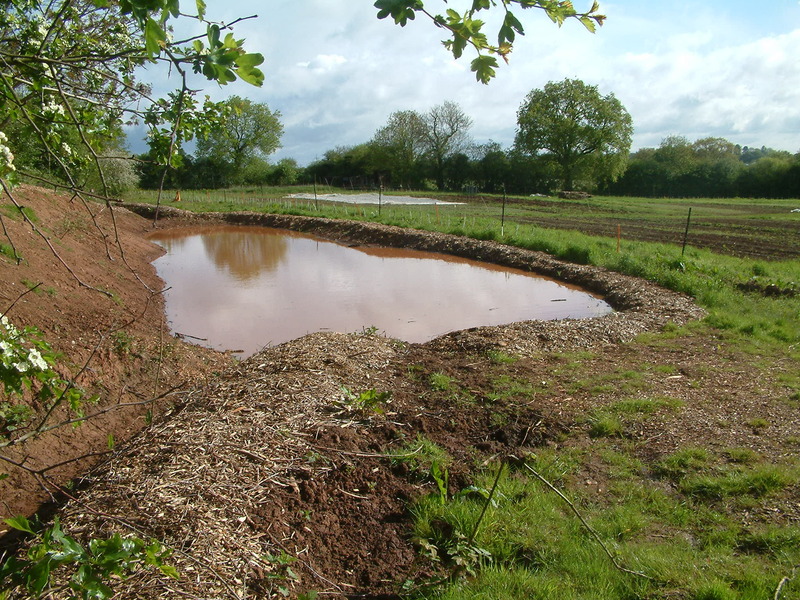 Over the winter, Jay and Kenton dug a pond at the top of the field and laid 600m of mains pipe. Photo: The 60,000+/- litre pond full to the brim! This year we had a damp winter (in Bristol) and an exceptionally wet spring (growers everywhere are struggling); there has been too much water at Sims Hill! There is the immediate challenge of growing crops this year and next. The wettest April-June on history has made life very difficult and leaves us vulnerable. There is the strategic challenge of how to manage the water in our landscape in a way that works with nature in a changing climate. These two extreme springs help give us a very clear idea of what needs to be done in order for Sims Hill to become more resilient and self-reliant, if weather patterns continue to be fickle! Last autumn we observed a couple of places where plant growth seemed too slow but it was unclear immediately as to why. Over the winter we observed that these places co-incided with the wettest parts of the field; they got wet quickest and took longest to dry out. We also noted that this was a combination of both run off and where the watertable came most readily to the surface. The most affected crops were those that don’t like wet feet! We were very interested to see how the pond and its arm-like catchment ditches would help. We didn’t have to wait long – the rains came! it was amazing to see how much water the pond catches and saves from running straight into the field, and how much wetter the field is beyond the reach of those arms. The pond when full then overflowed down the field (it has rained a lot!). In addition, test drainage ditches were dug by hand, to see if there is enough gradient down the whole field to move water out using gravity. Thankfully there is. We still had (have) too much water in the field though. It has been very hard to get much cultivation done, and planting has often been delayed as a result. It is clear that in wet years, we need to catch and store more water all the way along the top of the field, and we need to be able to drain more water out of the field lower down.